Proprietary Trading - What is Prop Trading & How Does It Work? 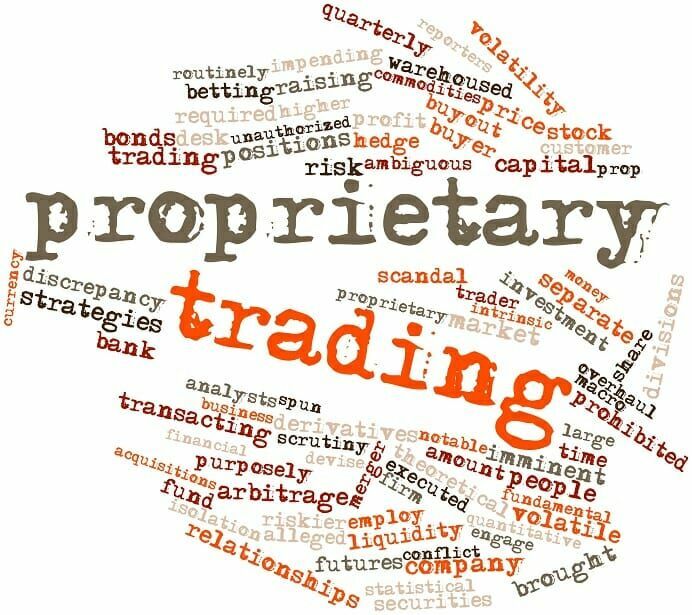 Proprietary Trading (Prop Trading) occurs when a bank or firm trades stocksStockWhat is a stock? An individual who owns stock in a company is called a shareholder and is eligible to claim part of the company’s residual assets and earnings (should the company ever be dissolved). The terms "stock", "shares", and "equity" are used interchangeably., derivatives, bondsBond IssuersThere are different types of bond issuers. These bond issuers create bonds to borrow funds from bondholders, to be repaid at maturity., commodities or other financial instruments in its own account, using its own money instead of using its clients’ money. It allows a firm to earn full profits from a trade rather than just the commission it receives from processing trades for clients. Banks and other financial institutions engage in this type of trade with the aim of making excess profits since they have knowledge that the average investor may not have. Traders use various strategies such as merger arbitrage, index arbitrage, global macro-trading and volatility arbitrage to maximize returns. Proprietary traders have access to sophisticated software and pools of information to help them make critical decisions. Although seen as a risky form of trading, proprietary trading is often one of the most profitable operations of a commercial or investment bankInvestment Banking Career PathInvestment banking career guide - plan your IB career path. Learn about investment banking salaries, how to get hired, and what to do after a career in IB. The investment banking division (IBD) helps governments, corporations, and institutions raise capital and complete mergers and acquisitions (M&A). Analysts work 100. During the financial crisis of 2008, prop traders and hedge funds were among the firms that were scrutinized for causing the crisis. The Volcker rule, which has severely limited proprietary trading, was introduced to regulate how proprietary traders function and to avoid possible conflicts of interest between the firm’s interests and that of its clients. Individual investors do not benefit from prop trading because the activity does not include trades executed on behalf of any clients. One of the benefits of proprietary trading is increased profits. Unlike when acting as a broker and earning commissions, the firm enjoys 100% of the profits. When investment banks trade on behalf of their clients and earn commissions, they earn only a fraction of the gains generated on behalf of the client. As a proprietary trader, the bank enjoys maximum benefits from the trade and the profits made are not shared with the individual investors. Another benefit of proprietary trading is that a firm can stock an inventory of securities for future use. If the firm buys some securities for speculative purposes, it can hold onto them and later sell them to its clients who want buy those securities. The securities can also be loaned out to clients who wish to sell short. Firms can quickly become key market markers through prop trading. For a firm that deals with specific types of securities, it can provide liquidity to investors on specific types of securities. A firm can buy these securities with its own resources and then sell to interested investors at a future date. However, if a firm buys securities in bulk and they become worthless, it will be forced to absorb the losses internally without affecting their client’s funds. The firm only benefits if the price of their security inventory rises or others buy it at a higher price. Proprietary traders can access sophisticated proprietary trading technology and other automated software. Sophisticated electronic trading platforms give them access to a wide range of markets and the ability to automate processes. Traders can develop a trading idea, test its usability and runs demos on their computers. In most proprietary companies, the trading platforms used are exclusively in-house and can only be used by the firm’s traders. The firms reap substantial benefits from owning the trading software, something that retail traders lack. Hedge funds invest in the financial markets using their client’s money, and they are paid to generate gains on these investments. On the other hand, proprietary traders use the firm’s own money to invest in the financial markets, and they retain 100% of the returns generated. Unlike proprietary traders, hedge funds are answerable to their clients. Hedge funds charge their clients high fees than other professionally managed funds. They are one of the targets of the Volcker Rule that aims to limit the amount of risks that banks and other institutions can take. Proprietary trading aims at strengthening the firm’s balance sheet by investing in the financial markets using its own money. It allows the traders to take more risks than necessary since they are not dealing with client’s funds. Firms go into proprietary trading with the belief that they have a competitive advantage and access to valuable information that can help them reap big profits. The traders are only answerable to their firms, and individual clients cannot benefit from the returns earned by the firm. The Volcker rule is part of the Dodd-Frank Wall Street Reform and Consumer Protection ActDodd-Frank ActThe former United States President, Barrack Obama, signed the Dodd-Frank Act into law in June 2010, as a response to the financial crisis. that was suggested by the former chairman of the Federal Reserve, Paul Volcker. The rule aims to restrict banks from making certain speculative investments that do not directly benefit their depositors. The law was proposed after the global financial crisis when government regulators determined that large banks made too many speculative risks. Volker argued that commercial banks engaged in high-speculation investments affected the stability of the overall financial system. Commercial banks that practiced proprietary trading increased the use of derivatives as a way of mitigating risks, but this instead often led to increased risks. The Volcker Rule prohibits banks and institutions that own a bank from engaging in proprietary trading or even investing in or owning a hedge fund or private equity fund. From a market-making point of view, banks focus on keeping customers happy and compensation is based on commissions. However, from a proprietary trading point of view, the customer is irrelevant, and the banks enjoy the full profits. Separating both functions will help banks to remain objective in undertaking activities that benefit the customer and that limit conflicts of interest. In response to the Volcker rule, major banks have separated the proprietary trading function from its core activities or have shut them down completely. Proprietary trading is now offered as a standalone service by specialized prop trading firms.